Crochet World aims to solve all those little tricky problems that you might encounter while learning crochet. 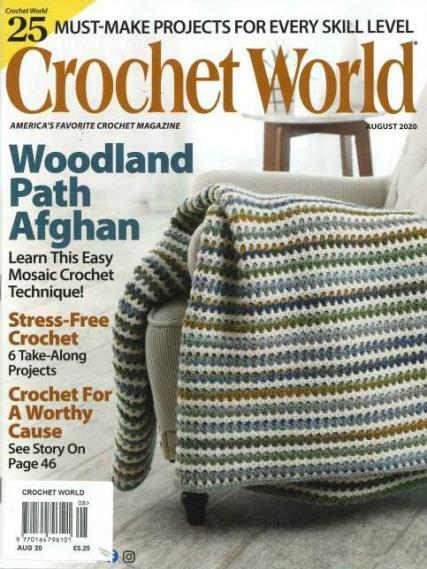 Buy a single copy or subscription to Crochet World magazine. However it is not just targeted at people who are just acquiring an interest in crochet, it is also aimed at people who are already a whiz at crocheting and are just looking to further their skills. Crochet involves little else other than a ball of yarn and two hooks, but the magic that can be spun using crochet is quite elegant and visually appealing. After a sudden dip in the popularity of crocheting and knitting among other things because of the extensive influx of machine made clothes, crocheting was almost becoming a dying art. The current trend was suddenly reversed by the sudden upsurge in the popularity of crocheting as an art. great magazine for the beginner and expert crocheter, the projects covers all interests, whether home deco or kitchen accessory, very helpful and creative ideas. a very practical magazine full of beginner to expert crochet projects. all projects are practical either for the house ,dressing, soft toys. This magazine has very different beautiful patterns.